A green flag with the town council shield on yellow disk in green ring near the hoist, and the words Birchwood Town Council in the fly. 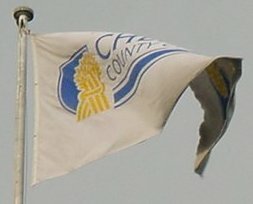 The website of Newton Newton Flags shows the flag of Knutsford Town Council as a blue sheet bearing the town's arms, crest and motto on a white oval. Details of the coat of arms can be found on Robert Young's Civic Heraldry site.